Benjamin Franklin was the US “Minister Plenipotentiary” in France — basically the ambassador — from 1776 to 1785, during the Revolutionary War. He was charged, along with others such as John Adams, with representing the United States in France. For a book about his work and life there, see Schoenbrun’s book, Triumph in Paris: The exploits of Benjamin Franklin. There is a statue of Franklin in Yorktown Square. 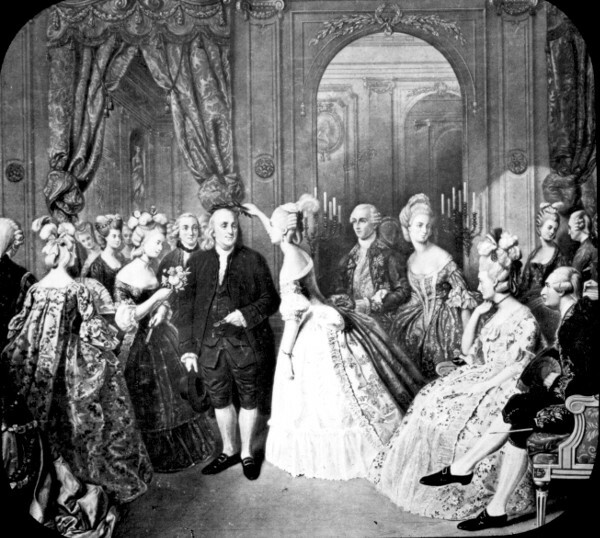 Franklin signed he Treaty of Friendship and Commerce with France at the Hôtel de Coislin. 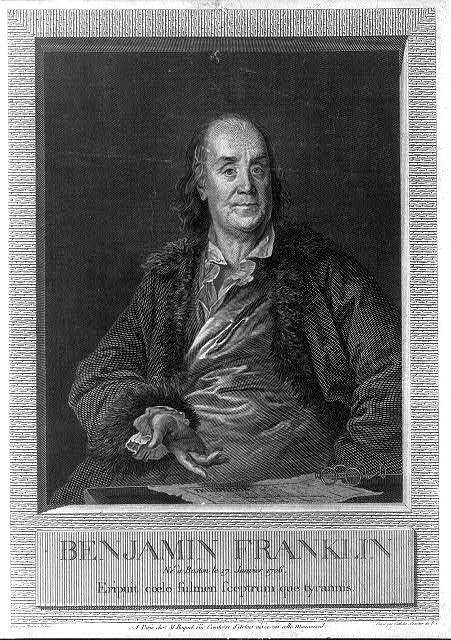 Franklin set up the first American Legation (i.e., embassy) at 66, rue Raynoud. This image was obtained at the US National Archives. Their caption: Benjamin Franklin at the Court of France. Painting by Hobens. 66-G-I5B-5. Vexed by your barbarous resolution, announced so positively last evening, to remain single all your life in respect to your dear husband, I went home, fell on my bed, and, believing myself dead, found myself in the Elysian Fields. Offended by this refusal of my Eurydice, I suddenly decided to leave these ungrateful spirits, to return to the good earth, to see again the sunshine and you. Here I am! Let us revenge ourselves. What a difference, my dear Friend, between you and me! — You find my Faults so many as to be innumerable, while I can see but one in you; and perhaps that is the Fault of my Spectacles. — The Fault I mean is that kind of Covetousness, by which you would engross all my Affection, and permit me none for the other amiable Ladies of your Country. You seem to imagine that it cannot be divided without being diminish’d: In which you mistake the nature of the Thing and forget the Situation in which you have plac’d and hold me. You renounce and exclude arbitrarily every thing corporal from our Amour, except such a merely civil Embrace now and then as you would permit to a country Cousin, — what is there then remaining that I may not afford to others without a Diminution of what belongs to you? The Operations of the Mind, Esteem, Admiration, Respect, & even Affection for one Object, may be multiply’d as more Objects that merit them present themselves, and yet remain the same to the first, which therefore has no room to complain of Injury. They are in their Nature as divisible as the sweet Sounds of the Forte Piano produc’d by your exquisite Skill: Twenty People may receive the same Pleasure from them, without lessening that which you kindly intend for me; and I might as reasonably require of your Friendship, that they should reach and delight no Ears but mine. There shall be eternal Peace, Friendship & Love, between Madame B. and Mr F.
In order to maintain the same inviolably, Made B. on her Part stipulates and agrees, that Mr F. shall come to her whenever she sends for him. That he shall stay with her as long as she pleases. That when he is with her, he shall be oblig’d to drink Tea, play Chess, hear Musick; or do any other thing that she requires of him. And that he shall love no other Woman but herself. And the said Mr F. on his part stipulates and agrees, that he will go away from M. B.’s whenever he pleases. That he will stay away as long as he pleases. That when he is with her, he will do what he pleases. And that he will love any other Woman as far as he finds her amiable.